PA chairman and Hamas leader congratulate Turkish President on his reelection. Palestinian Authority (PA) chairman Mahmoud Abbas on Sunday evening spoke to Turkish President Recep Tayyip Erdogan and congratulated him on his election victory. According to the PA’s official Wafa news agency, Abbas congratulated Erdogan on the success of the Turkish democratic process. For his part, the Turkish President affirmed the continued support of his country for the Palestinian people and their just cause and their right to freedom and independence, said the report. Hamas leader Ismail Haniyeh also spoke on the phone with Erdogan and congratulated him on his election victory. According to reports, Haniyeh told Erdogan that a delegation of senior Hamas leaders would visit Turkey soon to personally congratulate him. Erdogan won a projected 52.8% of the vote after 95% of the ballots had been counted as of Sunday night. His primary opponent in Sunday’s election, Muharrem Ince, head of the center-left Republican People’s Party, had just 29.9% of the vote. If Erdogan secures more than 50% of the vote after all the ballots are counted, he will avoid a run-off election in July. By 10:45 p.m. Ankara time, Erdogan declared victory, claiming a mandate from Turkish voters to continue as president. Erdogan, who leads the right-wing Justice and Development party, has since his election as Prime Minister staked out a bellicose anti-Israel position, freezing ties with the Jewish state after the Mavi Marmara incident in 2010, in which 10 Turkish Islamists were killed while attempting to breach Israel’s naval blockade of Gaza. Israel and Turkey signed a comprehensive reconciliation deal in 2016, ending a six-year diplomatic standoff following that incident. 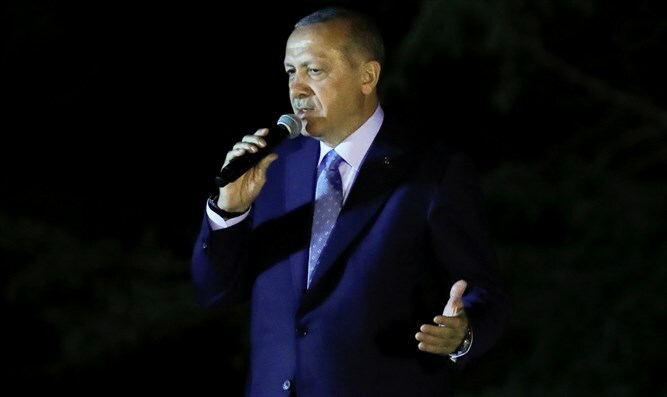 However, Turkish officials, and particularly Erdogan, have continued to verbally attack and criticized Israel even after the agreement was signed. Last month, Erdogan compared Israel to Nazi Germany, after Israeli forces opened fire on Gazans attempting to breach the Israeli border fence. He previously accused Prime Minister Binyamin Netanyahu of having blood on his hands and also insisted that Hamas is not a terrorist organization. Before the reconciliation agreement with Israel was signed, Erdogan met with Khaled Mashaal, then head of the Hamas politburo. The Turkish president later said he consulted with Hamas before signing the agreement with Israel.